Stansell Electric is one of the largest electrical contractors in Tennessee. They conduct electrical work, data, security, transportation, lighting, facility management and hazard controls. With 300+ employees working out of multiple offices, they have jobs large and small going on across the state. From urban high rises in Nashville, to industrial processing plants in the mountains they have worked anywhere power and data is needed in TN since 1940. Like many companies Stansell had been tracking tools by maintaining a list of what was purchased in Excel and in their accounting system, Viewpoint Vista Software. These lists were added to with each purchase. However, the lists were rarely updated as tools moved from person to person or as things were lost and damaged. This resulted in the list constantly being out of date and of very little use to operations or accounting. Jim Vice was tasked with finding a solution that would give him the accurate information he needed to make tool purchasing decisions. If he didn’t know what they owned then he was just guessing at what they needed. Jim started by researching and reviewing presentations from all the tool management software systems he could find. He looked at a variety of tracking and GPS based systems and was surprised at how many were available. As he reviewed system after system he saw the same problem over and over again. Most systems put the burden of tracking the tools on the office staff. Jim correctly determined that any system that required the office staff to constantly chase field personnel around would be doomed to fail. 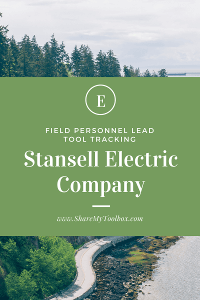 Stansell was going to effectively track tools then the field personnel who were using the tools had to be part of the solution. Thus, Jim decided that accuracy and simplicity for field users would be his most important decision criteria. After realizing the importance of simplicity for field use, Jim decided to begin testing ShareMyToolbox and Hilti’s OnTrack system. ShareMyToolbox was designed specifically to help field people take responsibility for the tools they are using. The responsibility first approach meant that the system was designed in reverse of the other systems Jim had evaluated. ShareMyToolbox was built for field people as a mobile app first. Then it was connected back to a web portal that the office could use. This field first approach was a new way to attack the old problem of tool loss and gave the system the ease of use Jim was looking for. While Jim was excited about this possible solution he knew that he had to be sure it would work prior to rolling it out at a company the size of Stansell. Thus, he started a pilot program. He signed up for a month to month agreement with ShareMyToolbox which allowed him to setup a test system and begin showing the process to others at the company. He also began working with a competitive inventory tracking system. The traditional tool inventory system took a command and control approach to tool tracking but also offered a mobile extension for field people. This gave Jim two systems to compare and determine if the simplicity of ShareMyToolbox or the bells and whistles offered by a larger system would be a better fit. After several months of testing and evaluation of both systems the team at Stansell made the decision to implement ShareMyToolbox. ShareMyToolbox was built for the field first and the field would need to take responsibility for tools if they were to be successful. ShareMyToolbox was extremely easy to use, especially for the field personnel. ShareMyToolbox would provide the accurate tool inventory list that was needed.